6 July 2013; Asiana Airlines; 777-200ER; HL7742; flight 214; San Francisco, CA: The aircraft was on a scheduled international flight from Seoul, South Korea to San Francisco, and the rear of the aircraft struck a seawall just short of the runway while landing. The tail section broke apart, and both horizontal stabilizers and the vertical fin separated from the aircraft. Both engines and the main landing gear also separated from the aircraft. The aircraft caught fire after it came to rest, but not before all of the crew and most of the passengers were able to escape. All 16 crew members survived, but thee of the 291 passengers, all teenage girls from China, were killed. Nine of the flight crew members and 40 passengers were seriously injured. Delayed execution of a go-around after they became aware that the airplane was below acceptable glide path and airspeed tolerances. Although air traffic control (ATC) allowed the aircraft to attempt a landing under visual flight rules, the flight crew used both the autopilot and autothrottle system during the landing. The sequence of events shortly before the crash featured a number of changes in the flight control system, and according to the NTSB the flight crew's understanding of how the aircraft performed in various autopilot and autothrottle modes led to the crash. The flight was vectored for a visual approach to runway 28L, and intercepted the final approach course about 14 nautical miles from the threshold at an altitude that put the aircraft slightly above the desired three degree glide path. The flight crew accepted an ATC instruction to maintain 180 knots until five nautical miles from the runway, but mismanaged the airplane's descent, which resulted in the airplane still being above the desired three degree glide path when it reached the five nautical mile point. In an attempt to increase the airplane's descent rate and capture the desired glide path, the pilot flying (PF) selected an autopilot mode that resulted in the autoflight system initiating a climb. The chosen autopilot mode, 'flight level change,' attempted to bring the aircraft to the selected altitude, which was above the aircraft's altitude at that point of the approach. The PF disconnected the autopilot, moved the thrust levers to idle, and then pitched the aircraft down, which increased the decent rate. When the PF disconnected the autopilot, that action caused the autothrottle to change to the 'hold' mode, which is a mode where the autothrottle does not control airspeed. Neither the PF or the other two pilots in the cockpit noted this change in the autothrottle mode. Asiana's procedures dictated that the approach must be stabilized by the time the aircraft descends to 500 feet above the airport elevation. The approach was not stabilized, and the crew should have initiated a go-around, but instead continued the approach. As the approach continued, it became increasingly unstabilized as the airplane descended below the desired glidepath. Airspeed continued to decrease, and at about 200 feet, the flight crew became aware of both a low airspeed and low glide path condition, but still did not initiate a go-around. The crew finally initiated a go-around when the airplane was at less then 100 feet of altitude. However, at that point the airplane did not have the performance capability to accomplish a go-around. The following information was in the NTSB report synopsis released on 24 June 2014, and from two NTSB media briefings given shortly after the accident. The main landing gear hit the sea wall first, followed by the tail section. The main landing gear sheared away from the aircraft as designed, and the wing fuel tanks were not punctured by the gear separation or during the rest of the crash sequence. The tail section broke off after the aircraft contacted the sea wall. Cabin flooring and galley components were found on the chevrons in the runway overrun area between the sea wall and the runway threshold. 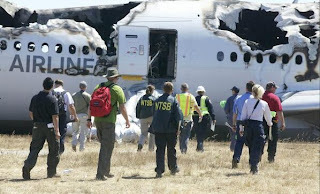 Two passengers and four flight attendants were ejected from the aircraft. All four flight attendants were seriously injured, and both passengers were killed. Neither of the ejected passengers were wearing seat belts at the time of the crash, and one of these passengers was later run over by two of the responding firefighting vehicles. The NTSB noted that had the passengers been wearing their seat belts, they would have likely remained in the aircraft and survived. One of the flight attendants initiated an evacuation after became aware of a post-crash fire. All but five of the passengers were able to evacuate on their own. Firefighters rescued five passengers, one of whom later died.